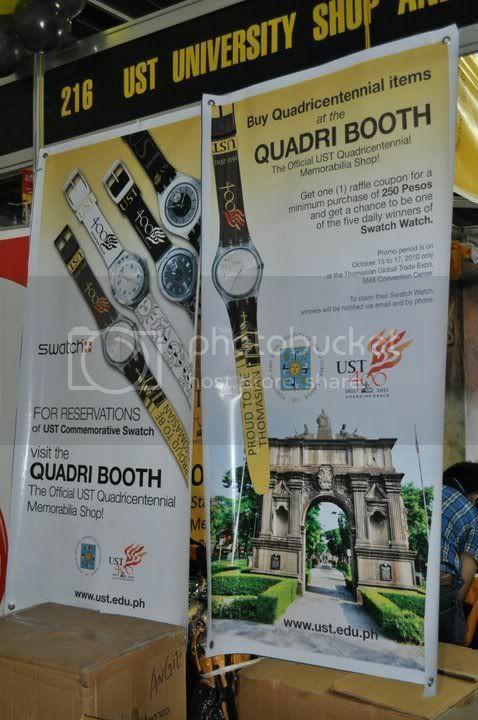 UST Quadricentennial activities! 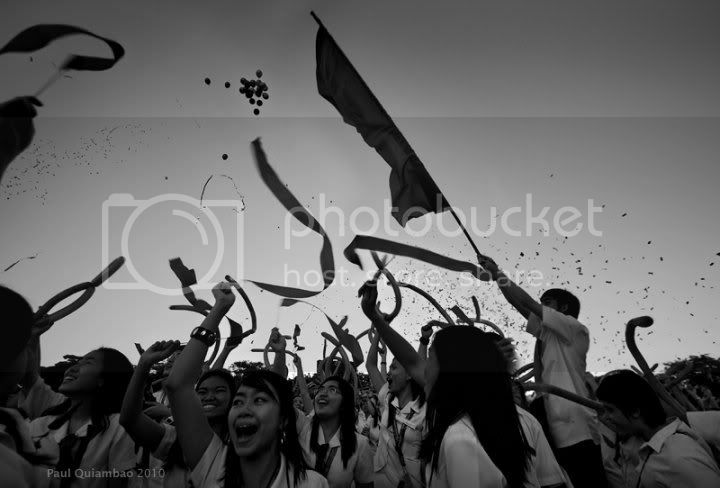 | One for UST!!! IN 2011, A BELOVED INSTITUTION will be celebrating 400 years of continued existence. 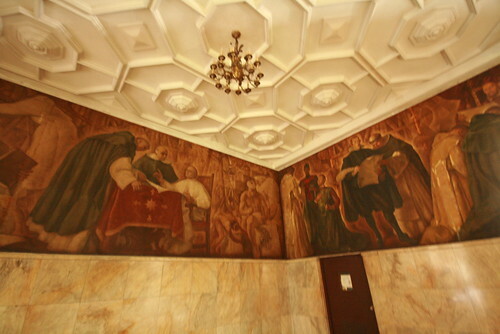 Serving the nation and the Church for which it has produced leaders and trailblazers, movers and builders, humanists and saints, the Royal and Pontifical University of Santo Tomas was founded in 1611 through a donation of his personal library and a bequest by Fray Miguel de Benavides, OP, the third archbishop of Manila. Across four centuries, UST has evolved into a world-class academic community that strives to inspire not only through quality education, but also through its physical form—through its built heritage, architecture and campus setting. 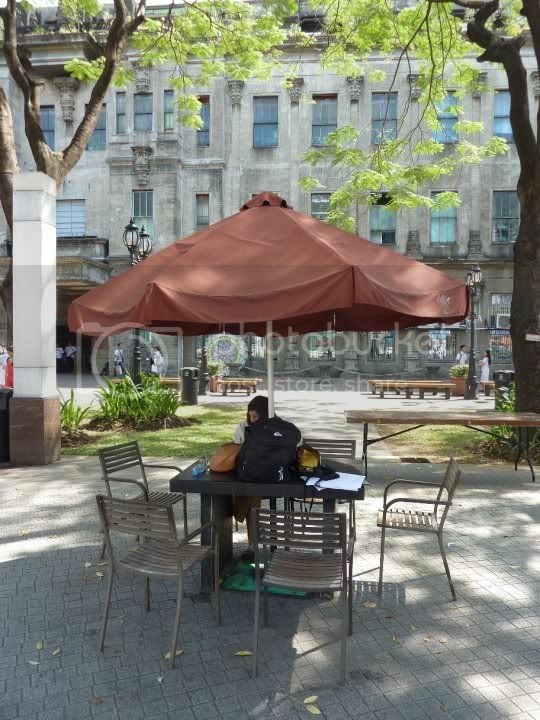 Sited in a 24-hectare square lot in the heart of Sampaloc, Manila, UST has become an important landmark and landscape in Manila. 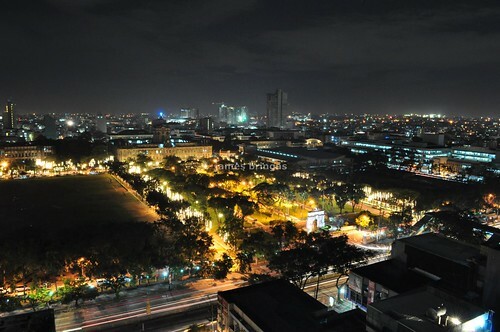 Though historically, the University was first located within the walls of Intramuros, its transfer to a then undeveloped swampland in what was then referred to as Loocan would eventually transform a notorious section of Manila, more famous for its prison, to a respectable community of religious, academics, and students. 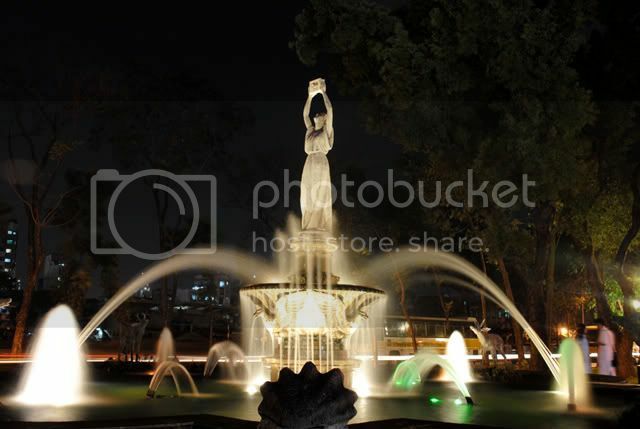 As Manila in the 1910’s was expanding southwards, the migration of families and schools to the posh suburbs of Ermita and Malate was an obvious choice. Going against better judgment, the glorious Dominican friars instead decided upon expanding in an undeveloped track of wasteland east of the city in what would eventually become the Sampaloc campus of the venerable institution. By 1911, coinciding with the 300th year anniversary of the University, the foundations for the new campus outside Intramuros were laid. With this, the master plan of expanding the services of learning and faith was set in motion. 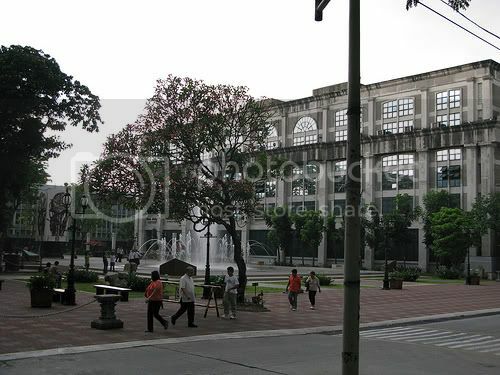 The UST Main Building, designed and built by the Spanish Dominican engineer, Fray Roque Ruaño, was the first building erected in the vast compound. 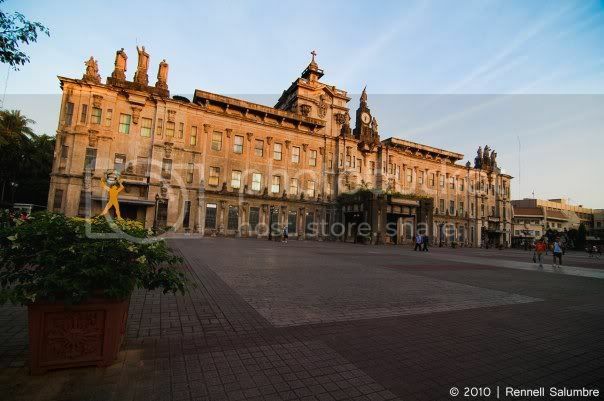 A hallmark of engineering and construction, the UST Main Building was the first earthquake-proof structure in the country. 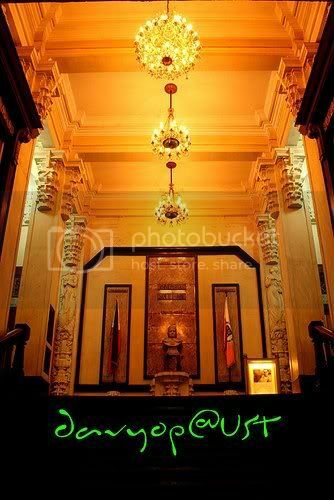 So sturdy was its foundations that no earthquake or calamity has been able to shake or even ruffle the building during its more than 80 years of history. The campus as well is home to other notable structures. 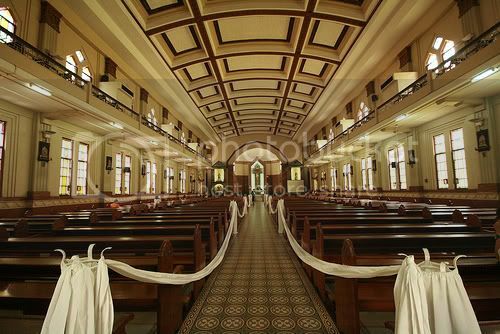 The UST Central Seminary houses the Parish of Nuestra Señora de Santisimo Rosario, Interdiocesan Seminary, UST Ecclesiastical Faculties of Philosophy, Theology and Canon Law, and the Priory of St. Thomas Aquinas (more familiarly known as Fathers’ Residence, or the convent of the Dominicans assigned in the Pontifical University). 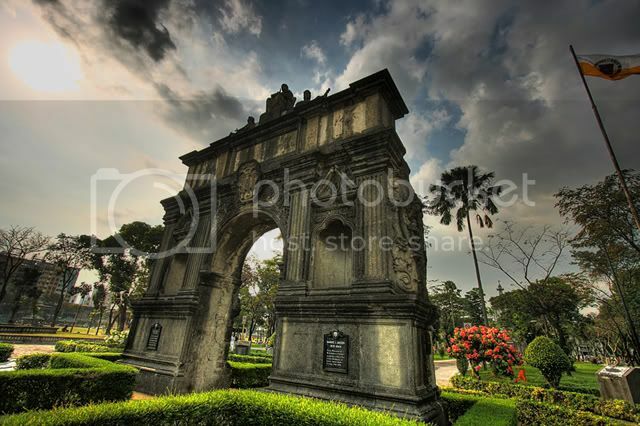 The Arch of the Centuries at the España entrance of the campus is a relic of the old UST campus in Intramuros. 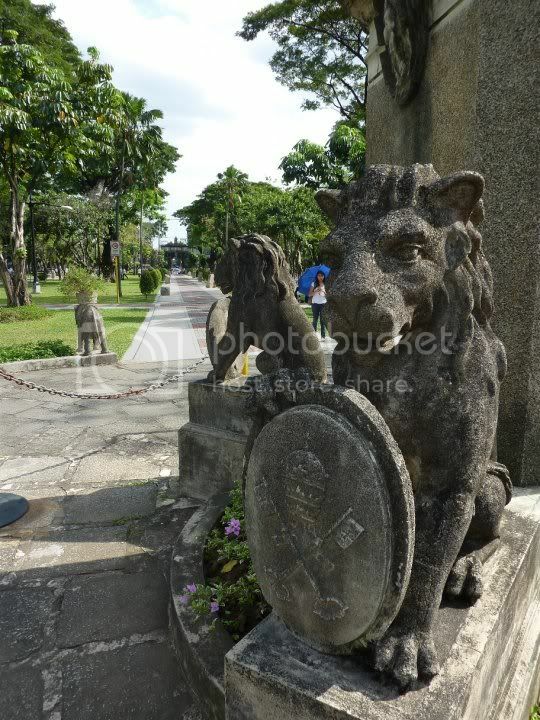 It serves as the link of the campus with its Intramuros roots and its Spanish heritage. 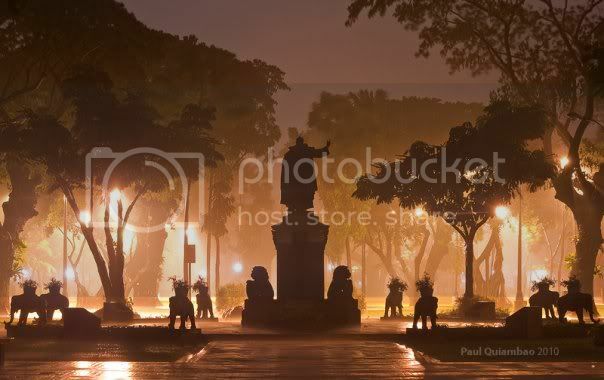 It has become a symbol of learning—the portal to greatness under which students and alumni (such as Rizal, Mabini, Quezon and Osmeña) have passed. 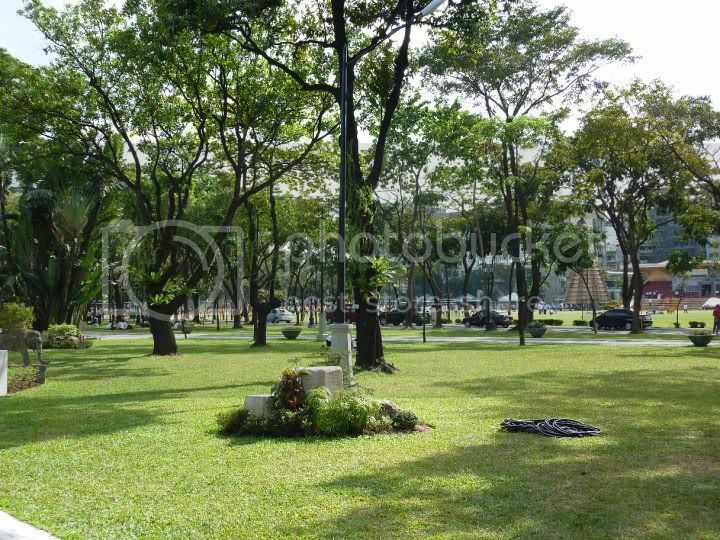 The campus grounds are noteworthy for here on various occasions, historic events took place, such as the interment of American and other nationals during the World War II, the Battle of Manila, and the three papal visits. 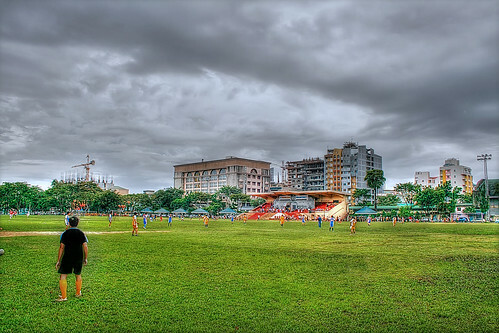 The grounds have been transformed from the original swamp with a creek crossing over it to a well-kept green field that has become the single biggest open green area in a Manila swimming amid a sea of concrete and tin-sheet roofing and pollution. 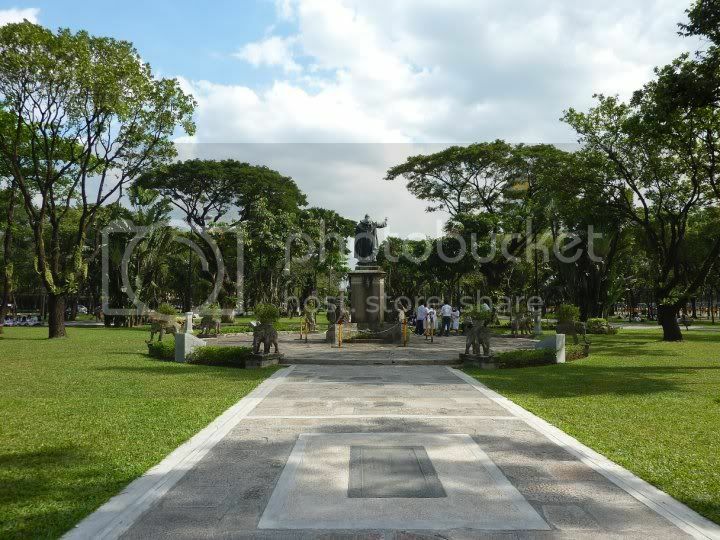 In the run-up to the University’s 400th anniversary next year, the National Museum of the Philippines will name today four sites in UST as “National Cultural Treasures”: the open campus grounds, the Main Building, the Central Seminary and the historic Arch of the Centuries. As heritage sites, they will be accorded protection and recognition, giving importance to their witness of 400 years of tumultuous Philippine history. 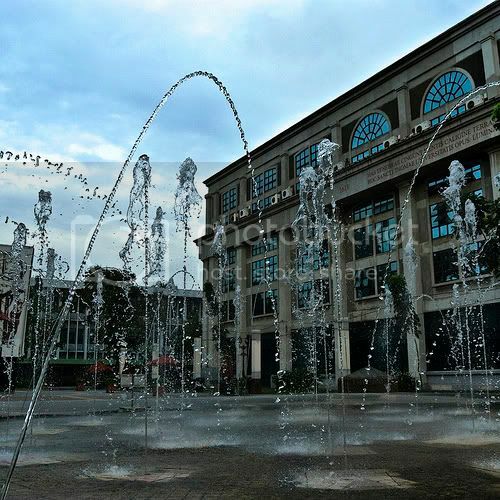 Contrasted with other notable institutions which within the last century alone have one way or another abandoned or obliterated their historic sites, UST continues to preserve its heritage sites while coping with changes. 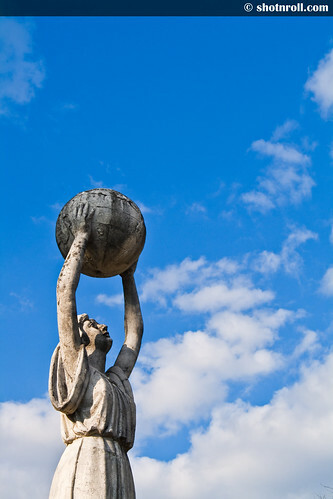 For quality education cannot be delivered solely through solid pedagogy, but also through built heritage and other cultural artefacts that embody an institution’s vision, mission, identity, and history. 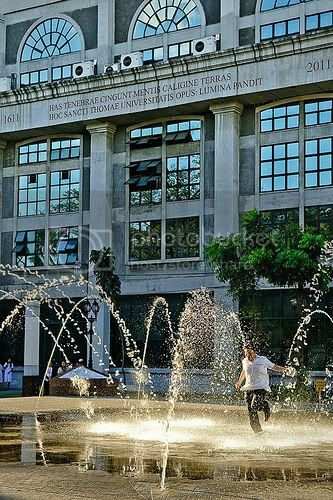 Truly, the University of Santo Tomas is one such institution whose historic identity is immediately evident to everyone who takes a glimpse of its campus. 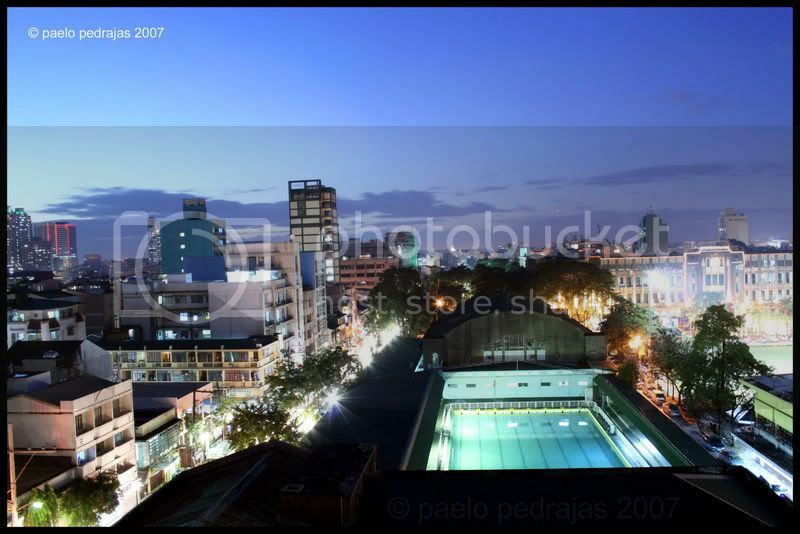 It is in the mind of everyone who commutes along the busy thoroughfare of España. 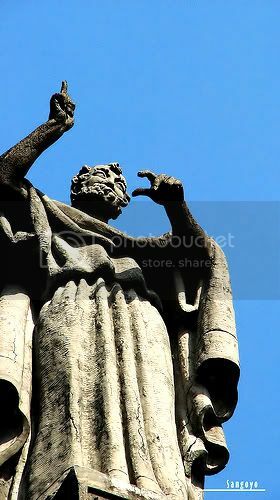 It is in the heart of every Filipino who ponders on the statue of Miguel de Benavides whose finge, in a teacher’s gesture of authoritative instruction, is pointed up into the heavens, as if motioning that all learning is a humble striving toward the wisdom of God. 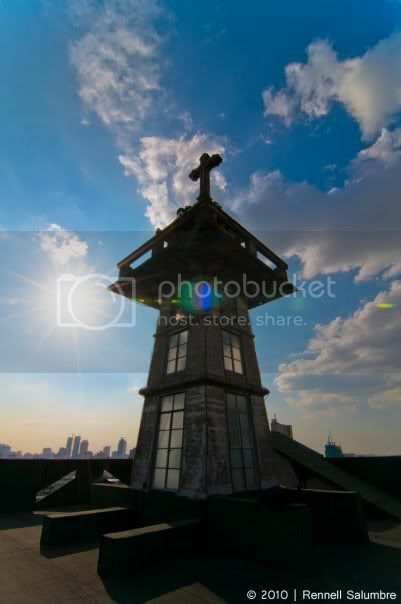 And it is seen, above all, in the UST Cross atop the UST Main Building, a symbol of faith thrust up into the skies, the symbol of the hopes and aspirations of a people and a nation -- for prosperity and progress, for service of God and man. 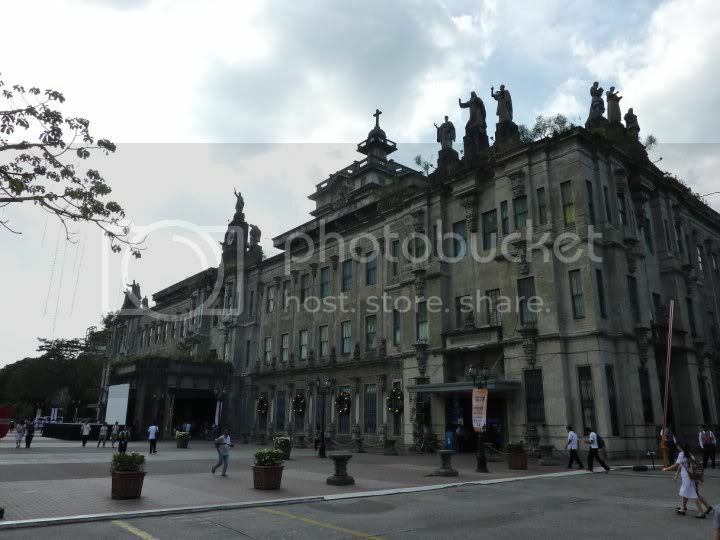 The tribute bestowed by the National Museum upon the University for its magnificent structures and grounds is a recognition of UST’s heritage and of the value of the past in a nation’s quest for a brighter future. Manuel Noche is an architect, architecture historian, professor at the UST College of Architecture. 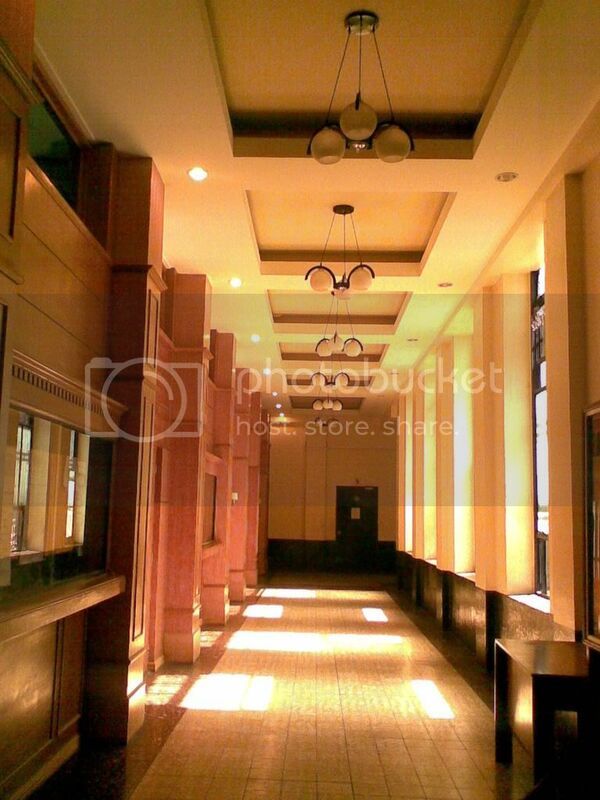 He is a member of the Heritage Conservation Society. Viva La Fuerza Tigre! Viva Santo Tomas! 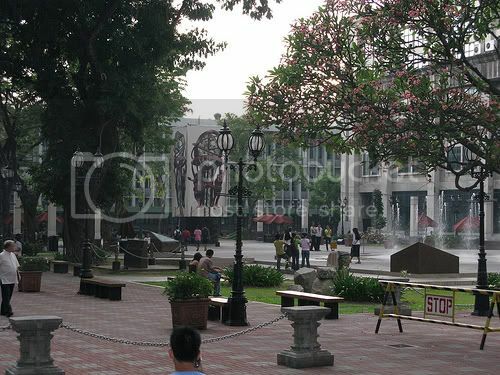 MANILA, Jan. 20 –- The National Museum (NM) has declared the structures of the University of Santo Tomas (UST) in Sampaloc, Manila as national treasures due to their historical and cultural heritage for 83 years. 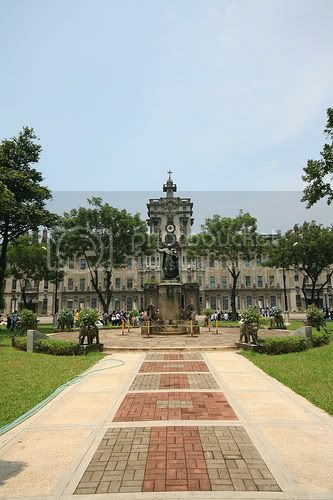 Fontanilla said NM will give a declaration of the UST Main Building, the Central Seminary, the Arch of the Centuries and the University’s Open Spaces as National Cultural Treasures. 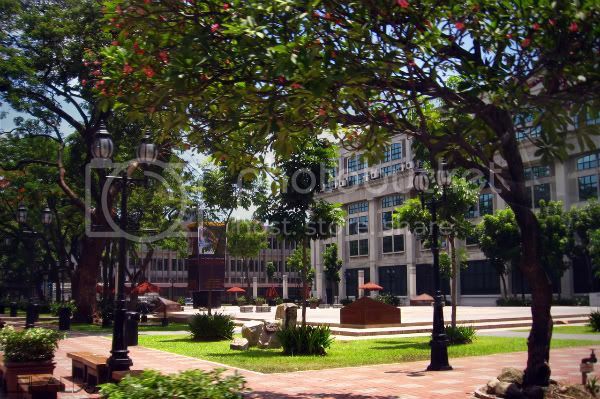 Historians said that in 1927, the UST campus transferred to España Boulevard in Sampaloc from Intramuros. 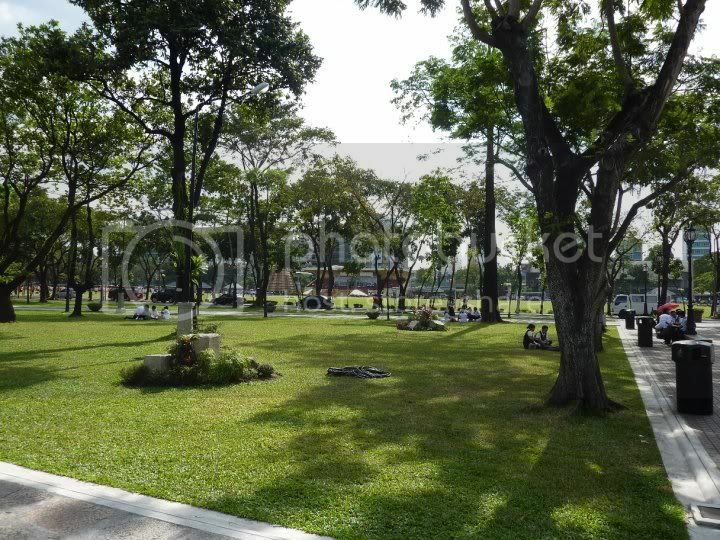 The present campus covers a total of 21.5 hectares. 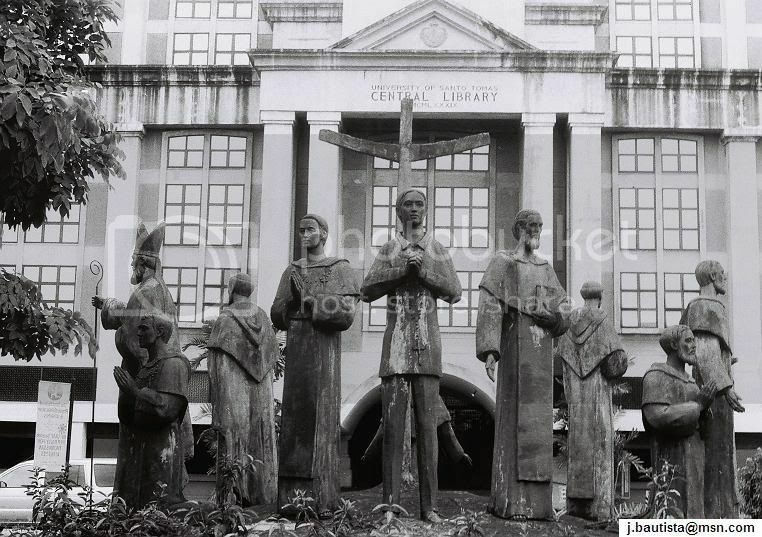 Since UST's establishment in 1611, the university academic life was disrupted only twice. 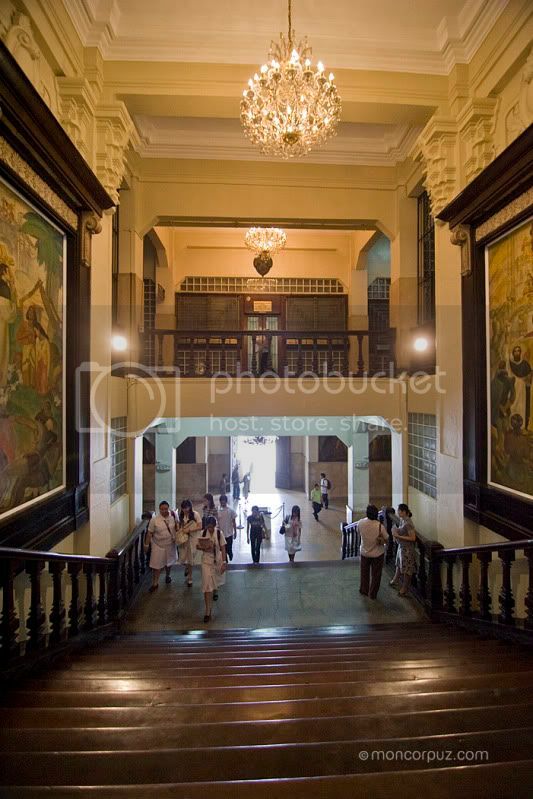 Once, from 1898 to 1899, due to the Philippine revolution against Spain; and the second time from 1942 to 1945, when the Japanese Occupation Forces converted the UST main building into a concentration camp during the Second World War. Section 3 of "The Cultural Properties Preservation and Protection Act" states that a "National Cultural Treasure is a unique object found locally, possessing outstanding historical, cultural, artistic and/or scientific value which is significant and important to this country and nation." 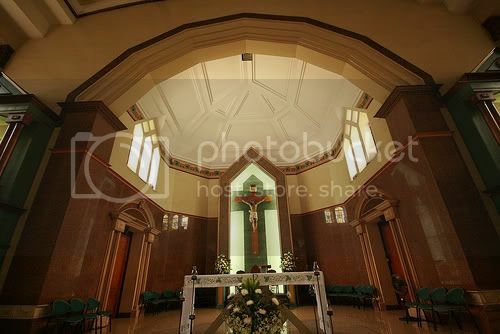 This prestigious recognition marks the first-ever inclusion of an educational institution among the ranks of National Cultural Treasures, with the majority of structures being churches and the rest being terrestrial landmarks, intangible cultural property and movable objects. Fontanilla said the declaration, considered a milestone for UST, is the culmination of efforts which began in 2004. 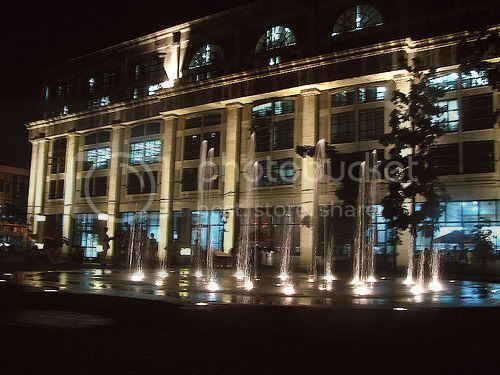 “Also, it coincides with the various activities for UST’s Quadricentennial celebration in 2011,” Fontanilla told the PNA. 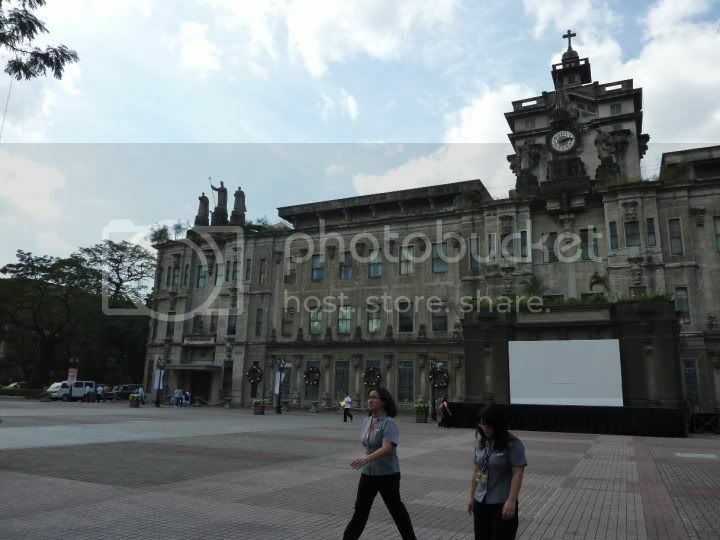 At 3:00 p.m. on January 25, 2010, the National Museum will recognize the key role of the University of Santo Tomas in our nation’s historical and cultural heritage through its formal declaration of the UST Main Building, the Central Seminary, the Arch of the Centuries and the University’s Open Spaces as National Cultural Treasures. Section 3 of “The Cultural Properties Preservation and Protection Act” states that a “National Cultural Treasure is a unique object found locally, possessing outstanding historical, cultural, artistic and/or scientific value which is significant and important to this country and nation.” This prestigious recognition marks the first ever inclusion of an educational institution among the ranks of National Cultural Treasures, with the majority of structures being churches and the rest being terrestrial landmarks, intangible cultural property and movable objects. 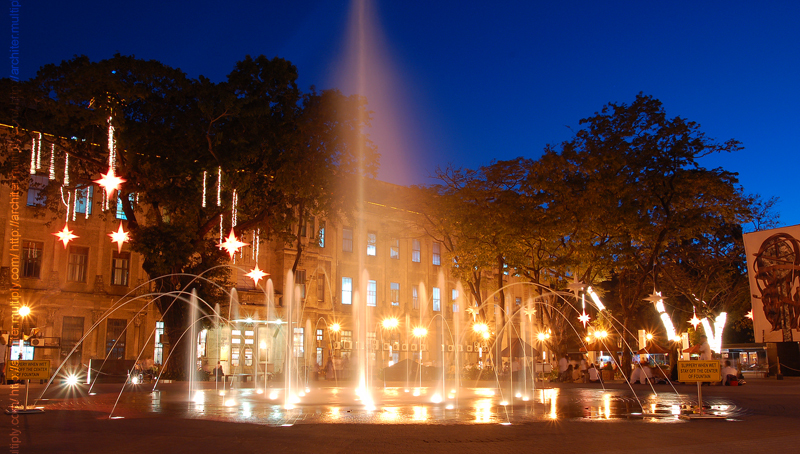 The declaration, considered a milestone for UST, is the culmination of efforts which began in 2004. 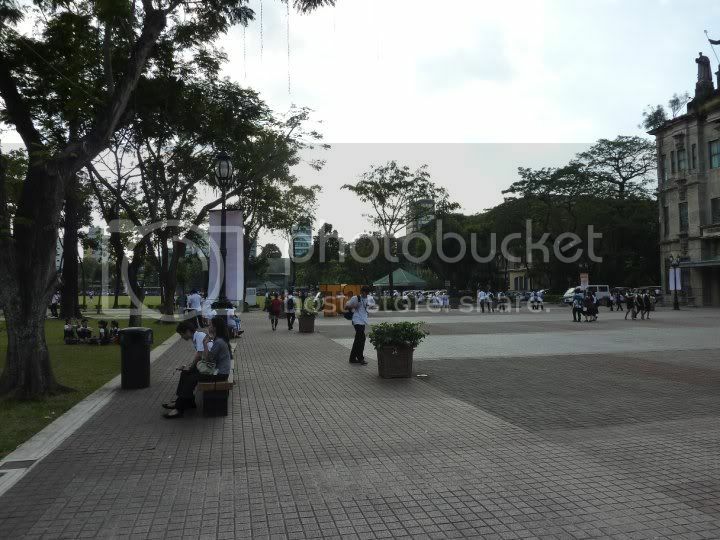 Also, it coincides with the various activities for UST’s Quadricentennial celebration in 2011. The declaration ceremonies will be held at the UST Main Building Lobby following the unveiling of “The Foundation of the University of Santo Tomas by Archbishop Benavides”, an oil on canvas painting dated 1911 and restored through the UST Museum’s Heritage Conservation Fund. 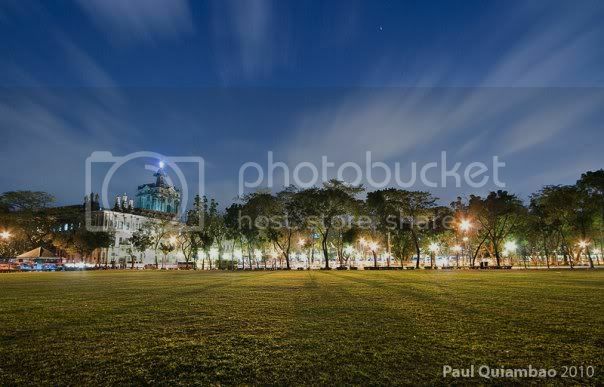 THE NATIONAL Museum has declared the 82-year-old UST Main Building, the Central Seminary, the Arch of the Centuries, and UST’s open spaces as “National Cultural Treasures” ahead of the University’s Quadricentennial in 2011. 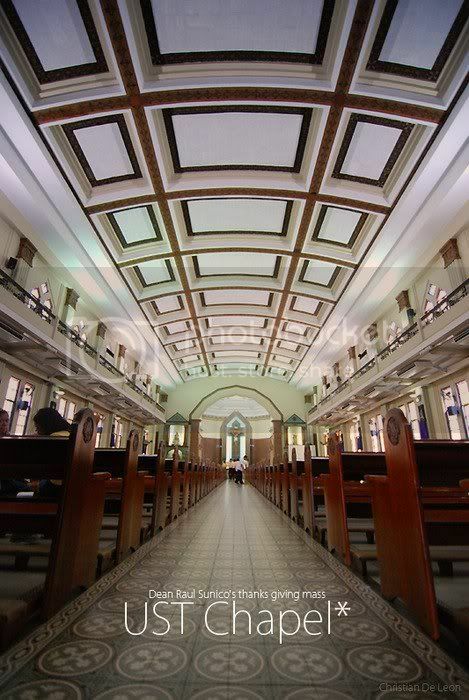 This is the first time for an educational institution to join the roster of National Cultural Treasures, with the majority of such structures being churches, and the rest being terrestrial landmarks, intangible cultural property, and movable objects. 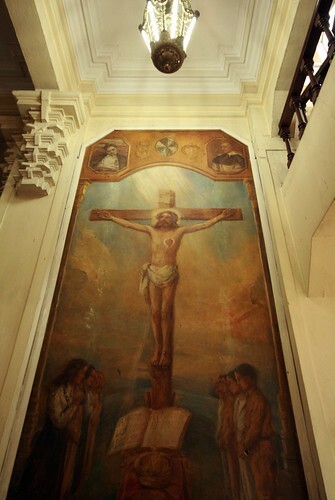 The January 25 declaration followed the unveiling of the nearly century-old painting “The Foundation of the University of Santo Tomas by Archbishop Benavides,” restored through the Museum of Arts and Sciences’ Heritage Conservation Fund. 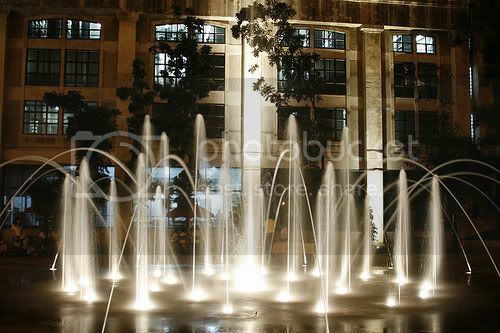 The countdown to UST’s 400th year officially began last December 18, with the unveiling of four “quadricentennial symbols” before a record crowd that bore witness to the University’s “most memorable” Christmas celebration. 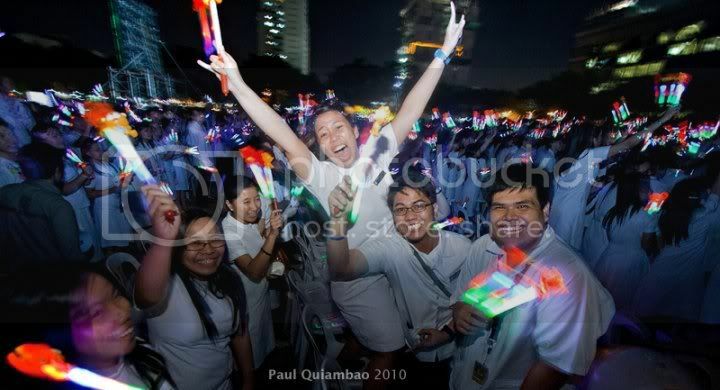 An estimated 50,000 people who attended the annual Paskuhan saw the launching of the quadricentennial flag, countdown clock, song, and prayer at the “Countdown, Count Me In!” program themed “4 horas, 4 dias, 400 days, 400 taon,” which represented the three cultures— Spanish, American, and Filipino— that defined UST’s history. After a parade of costumes from the Spanish colonial era to the 21st century, the four-hour program started with the recitation of the quadricentennial prayer by Fr. Pompeyo de Mesa, O.P. 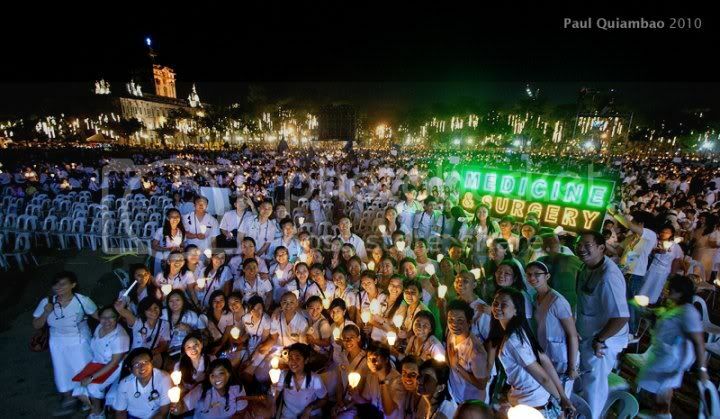 over a candle lighting ceremony at the UST field. This was followed by the lighting of the 80-foot Christmas tree and University grounds, and the revelation of the quadricentennial flag. The “Q flag,” designed by Fine Arts Regent Fr. 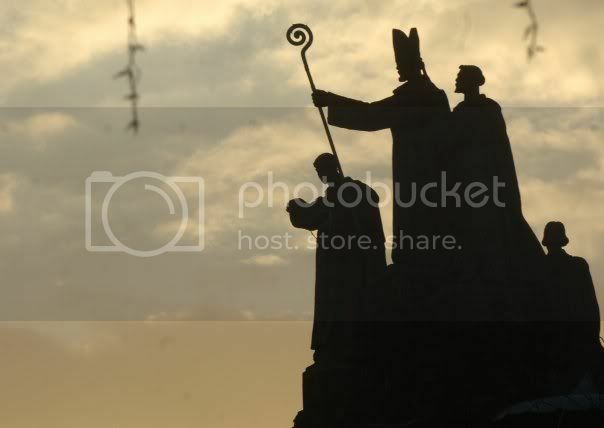 Edgardo Alaurin, O.P., and former Varsitarian assistant art director Jonathan Gamalinda, bears the sun and the Dominican cross from the UST logo along with an embroidered “2011” at the center, the statue of UST founder Miguel de Benavides, the Main Building, and doves. The upper horizontal half of the flag is colored yellow to symbolize St. Thomas Aquinas, while the other half is colored blue symbolizing the University’s Marian devotion. 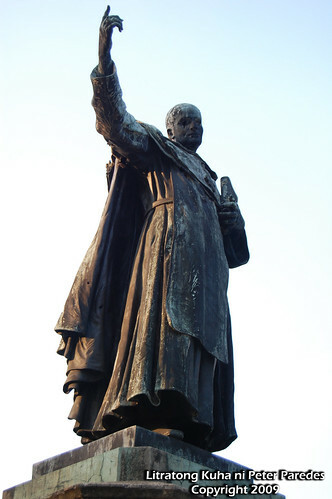 The image of Benavides’ statue is found at the left side “to signify [UST’s] passion for education,” while doves soar from his finger tip as a symbol of the Thomasian free spirit. “We included the doves in the sky to give the impression of the vastness of the sky, God’s grace, and the spirit of a flying bird,” Alaurin said. Alaurin and Gamalinda were assisted by Fine Arts professor Romeo Remalante, also a former Varsitarian artist, in designing the flag. The flag’s design was a modified version of a painting created by Dante Lerma, one of the participants at the quadricentennial logo making contest three years ago. The flag was raised simultaneously with a dance number from the Salinggawi Dance Troupe, drum rolls from the Yellow Jackets, and an exhibition from the Main Building. A star-studded program followed with Thomasian beauty queen and UST alumna Miriam Quiambao as host, while actor JC Cuadrado gave away raffle prizes such as net books and gift certificates worth P5,000 each. Thomasian entertainers graced the show– singer Jamie Rivera (College of Commerce), comedienne Beverly Salvejo (Science), former Pinoy Dream Academy “scholar” RJ Jimenez (Engineering), internationally acclaimed singers Isay Alvarez (Arts and Letters) and Robert Seña (Fine Arts), actor Polo Ravales (Education), and dancer Archie Alemania (Artlets). Bands Sandwich and 6CycleMind, both managed by a Thomasian, also performed. The 20-foot tall countdown “beat man” clock designed by Gamalinda signaled the start of the countdown by 12 midnight. It was manufactured by Swatch, the Swiss watch company. “What the people see is not yet the final design of the beat man. But the colors are correct. We are just waiting for the finalization of details including the permanent location of the beat man,” Gamalinda said. 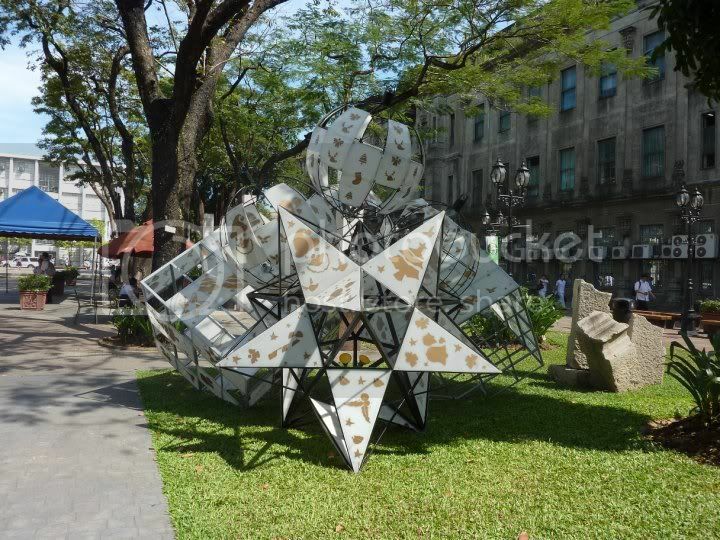 He said his design was inspired by the UST seal, which includes the lion and sea lion symbolizing the Royal Seal of the King of Spain, and the Seal of the City of Manila, respectively, the Papal tiara, and a flower for the Virgin Mary. “When people think of UST, it has to be the combination of these four seals without one of these, UST is not UST,” Gamalinda added. The quadricentennial song “Ako’y Isang Tomasino” composed by Gerardo de Leon and arranged by award-winning composer Jimmy Antiporda (both from Engineering) was sang by Thomasian singers Apple Chui and Aicelle Santos with Rhap Salazar and the UST Singers. 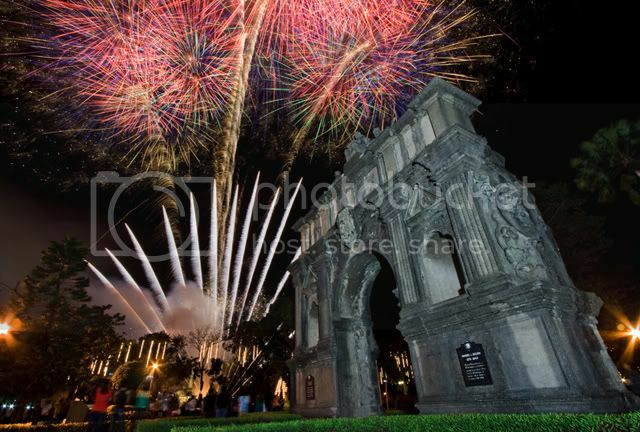 This was followed by a 10-minute fireworks display at 12 midnight which culminated the program. 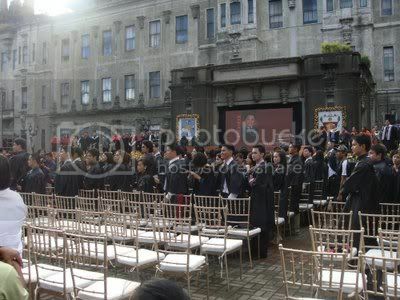 The “Q song” proclaims the University as “a strong institution standing the test of time,” Rector Fr. Rolando de la Rosa O.P., said in his opening speech. 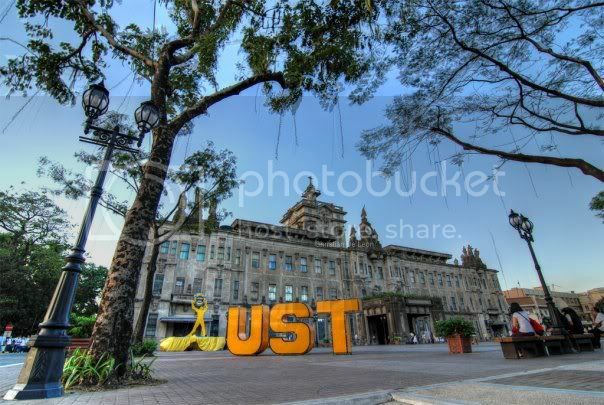 “We are the University of Santo Tomas. 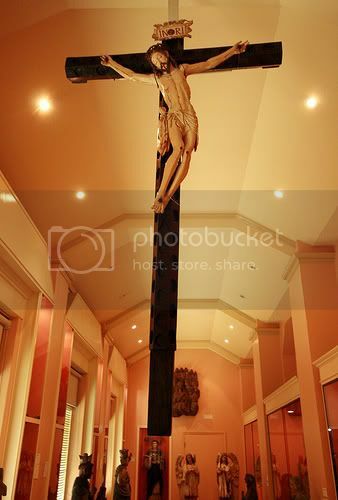 We are older than the Filipino nation, older than Harvard, older than any university in Asia and the New World, but younger in vision, in our faith, in our hope, in our love because we are blessed with unending grace,” he said. and there's more to come! 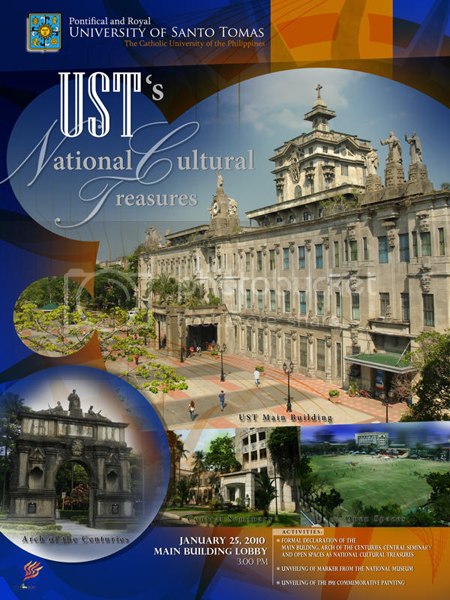 Ganda ng Varsi article regarding UST sites being declared national treasure. 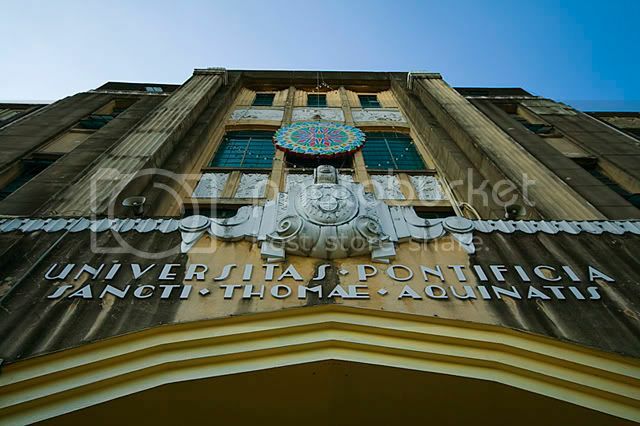 Ramon Christopher Sy Juco, Jr.
"400 Years Old And Still Standing"
UST, Thomas Aquinas Research Complex. LET THE year of the Tiger be for the Tigers. 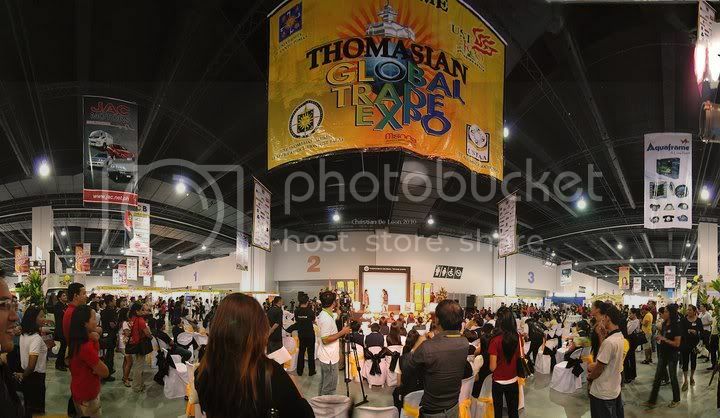 A UST alumnus is pushing for the official declaration of 2010 as “Year of the Thomasians” by President Gloria Macapagal-Arroyo herself, saying it would be a perfect gift to UST on the eve of its Quadricentennial. College of Architecture and Fine Arts alumnus Rhoel Mendoza, through a letter to the President last July, cited the University’s rich history and illustrious alumni as reasons why 2010 should “belong” to Thomasians. “I believe this would be a very good way of beginning the second decade of the 21st century and the perfect prelude to the global celebration of UST’s Quadricentennial in 2011,” Mendoza said in his July 2009 letter published on the Philippine Daily Inquirer last February 16. Mendoza, a recipient of the Philippine Overseas and Employment Agency Bagong Bayani Award in 1990, cited former president Joseph Estrada’s declaration of the year 2000 the “year of the overseas Filipino workers” after a year-long campaign he had initiated. His new proposal had little progress, however, noting that only a recommendation by the President’s correspondence office to the Presidential Legislative Liaison Office was made last August 6. The liaison office serves as the bridge between the executive and the legislative branches of government, which means Malacañang has left the decision to Congress. “It is not yet too late to push for the declaration,” the letter read. 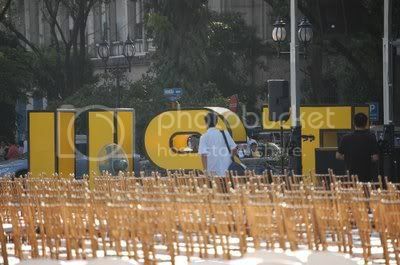 Because of the President’s apparent snub, Mendoza created an online journal titled “UST@400,” the unofficial blog site of the Quadricentennial celebrations, in the free blog site blogspot.com to push for his advocacy. 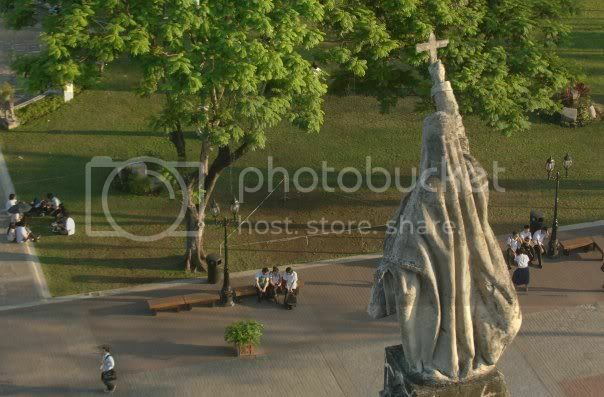 my gosh, i am teary eyed by just looking at these photos, brought back a lot of memories..i miss ust..!! 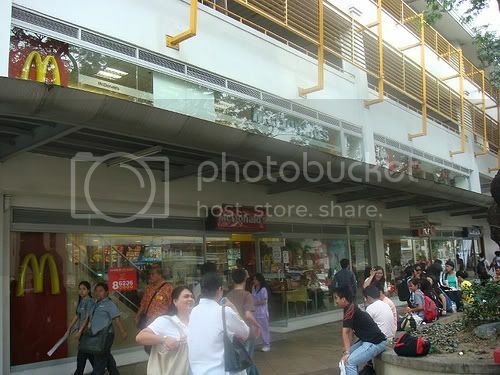 it is so different from when i was there in the 1990's kung kelan ang tawag pa sa atin ay glowing goldies..gosh, i feel so old.. Welcome neo0325 to this forum. I myself started my schooling in UST during the mid 90's, though the team's name was already called the Growling Tigers then. 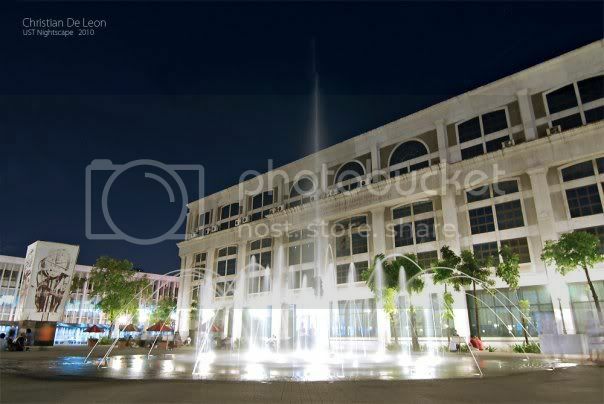 Since then, there has been a lot of changes in the university in so many aspects. 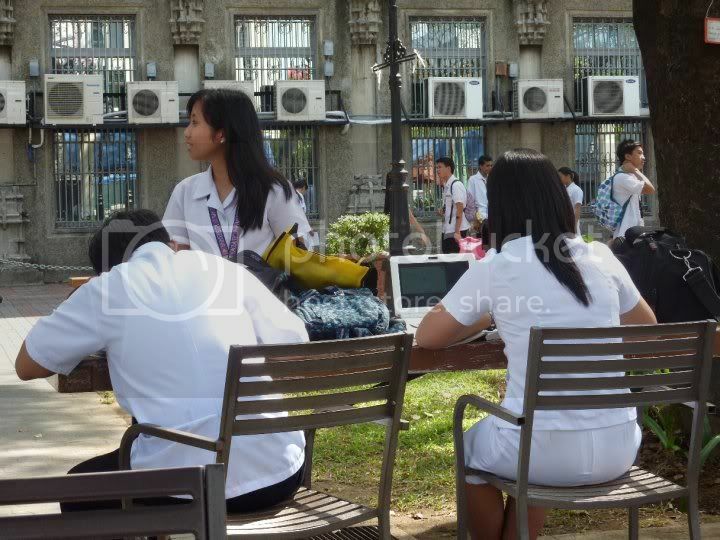 I guess its just progress and that UST must adjust with the times. thanks voltairemad....yes a lot has changed, pero when i was in ust, si fr de la rosa and rector namin and sya pala ulit, the last time i went there was about two yrs ago when i visited my uncle in the hospital...nagulat ako sa mga changes, wala na ang covered catwalk na nilalakaran ko from espana to dapitan, sa building ko, na pag taga commerce ka, eh ang tawag ay commerce building pero pag taga AB ka, ang tawag ay AB building..but my friends and i promised to be there on the quadricentenial celebration..
Every inch a Thomasian, Piolo Pascual and Charlene Gonzales posed as models recently for a life-size sculpture to rise in a strategic place within the University of Santo Tomas along España Boulevard in Manila in line with the university’s celebration of its quadricentennial. 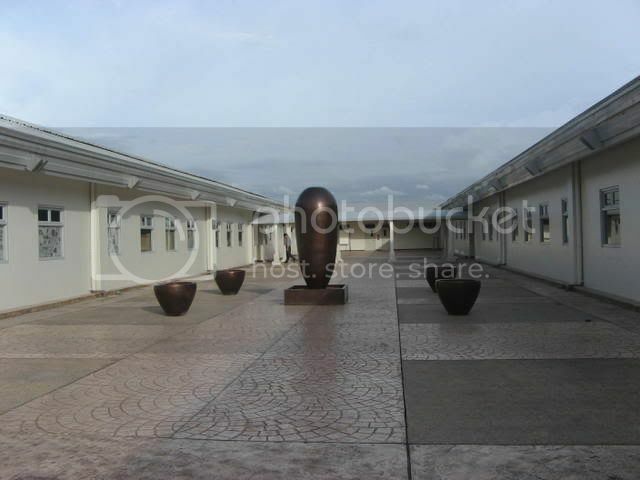 The sculpture, called Tetra Global, is a creation by another Thomasian, multi-awarded artist Ramon Orlina, representing four different personality groups that make up the University. Piolo and Charlene, who attended UST as students in their youth, were picked to represent the face of the Thomasian studentry. 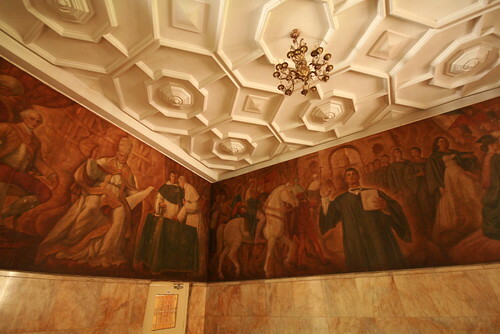 Two other images join them in the work of art, one representing the faculty, another standing in for the Dominican priests who founded and continue to run the school, which is celebrating its quadricentennial or 400th anniversary in 2011. 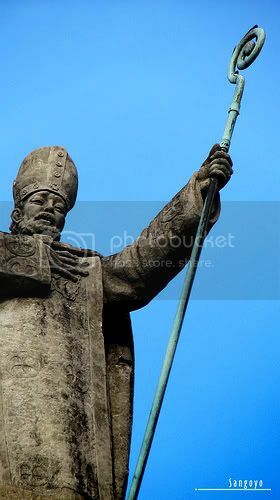 UST was founded by the Dominican priest, Bishop Miguel de Benavides in 1611. 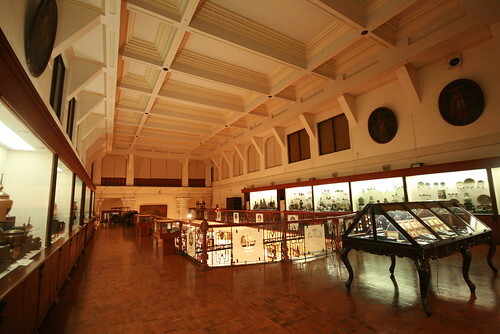 The school is reputed to be older than Harvard University in the United States and is considered the oldest in this part of Asia. Unveiling of the Tetra Global itself, says Giovanna Fontanilla, director of UST’s Public Affairs Office, will take place on Jan. 28, 2011 at the Quadricentennial Plaza behind the UST Main Building. The occasion formally kicks off UST’s year-long celebration of its 400 years, marked by concerts, art exhibits, lectures, fora, etc. 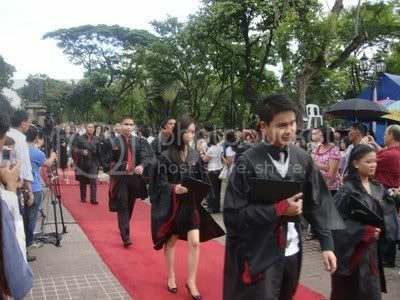 Piolo attended the university’s Faculty of Arts and Letters but failed to finish his degree when his family moved to the United States. Charlene graduated with a pre-Med degree in the College of Science. 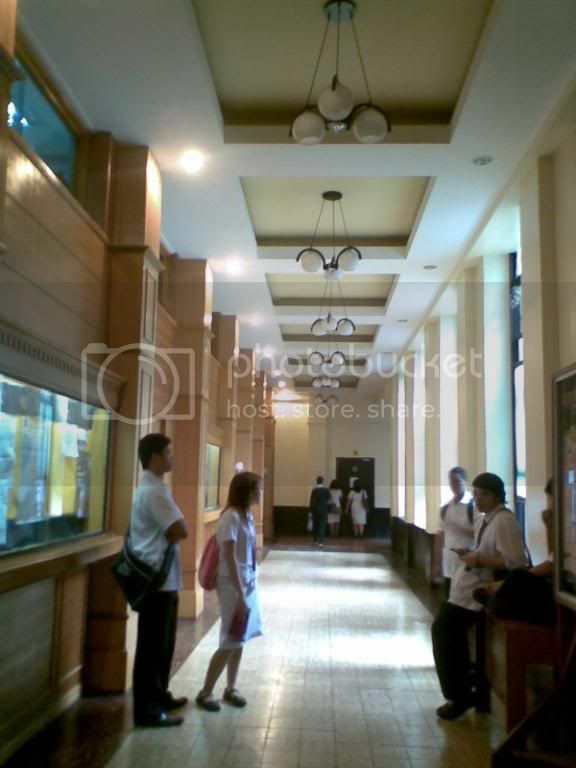 Both were active in extra-curricular activities during their stay in UST. Piolo was a budding actor in Teatro Tomasino and Artistang Artlets while Charlene was a member of her college’s varsity volleyball team. Piolo and Charlene’s joint effort to help their university celebrate a milestone came to mind recently as we met up with them on two separate occasions, both of them advertising-related. On his launch as a Century Bangus endorser, Piolo said he was sorry he didn’t have time to finish college but made special mention of a teacher he admired dearly, Artlets Sociology professor Josephine Aguilar. Missed for sometime now on both the small and the big screens, Piolo is doing a teleserye next where he plays the policeman father of Santino star, Zaijan Jaranilla. Charlene, on the other hand, is enjoying a temporary leave from showbiz to devote more time for her family. The former Bb. Pilipinas-Universe, speaking on behalf of her new endorsement, dietary supplement Cenovis, says she believes in the benefits of Omega-3 rich fish oil to the body. Cenovis is one of Australia’s top three dietary supplement brands. Singers of the University of Santo Tomas (UST) in Manila gained honor for the Philippines anew after receiving two special awards at a recent international festival in Ireland. The Department of Foreign Affairs said the awards were given at the Fleischmann International Trophy Competition at the 56th Cork International Choral Festival in Cork, Ireland, last May 1. "The two awards are the Lady Dorothy Mayer Memorial Trophy for the performance of a piece in the competition, and the Peace Trophy for the choir who touched the hearts of all who heard them and exemplified the intentions of the trophy's benefactors, the P.E.A.C.E. Movement in Cork," the DFA said, citing a report from the Philippine Embassy in Ireland. It said the UST Singers were under Professor Fidel Gener Calalang Jr.
Philippine Ambassador Ariel Abadilla commended the UST Singers for ably representing the Philippines in one of Europe's premier international choral festivals. Founded in 1954, the Cork International Choral Festival is noted for its high competitive standards, excellent organization, and the friendliness of its welcome. The Festival attracts some 5,000 participants. Pope Benedict XVI has turned down an invitation to attend this year's 400th founding anniversary of one of Asia's oldest university, the University of Santo Tomas, and will send a representative instead. Papal Nuncio Archbishop Edward Joseph Adams formally relayed the information to the Catholic Bishops' Conference of the Philippines (CBCP) in a May 7 letter. "The Holy Father will not be coming to Manila for the anniversary, but given the importance of the quadricentennial celebrations of the university, His Holiness will be sending for the occasion his special envoy, whose name will be published in L'osservatore Romano the afternoon of Saturday, 27 November 2010," Adams said in a letter to CBCP president Tandag Bishop Nereo Odchimar. Excerpts of the letter were posted Thursday on the CBCP news site. It was the third time that Pope Benedict XVI was invited to visit the Philippines since his installation to the Papacy in 2006, according to the CBCP. 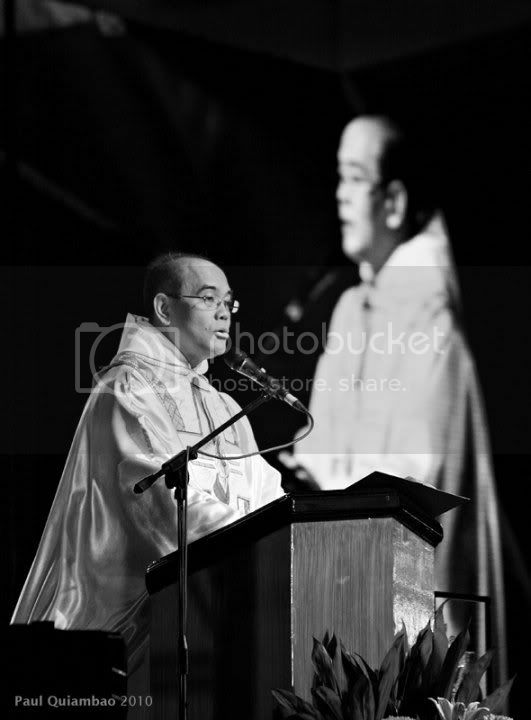 He was invited to grace the Asian Youth Day held in Cavite last November and the second National Congress of the Clergy held at Pasay City last January. The papal nuncio has informed Philippine bishops that Pope Benedict XVI won’t attend next year’s quadricentennial celebrations, according to the official news agency of the local episcopal conference. 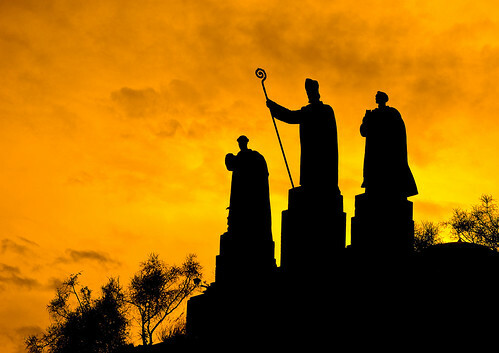 In a May 7 letter, Archbishop Edward Joseph Adams, apostolic nuncio to the Philippines, told Tandag Bishop Nereo Odchimar, president of the Catholic Bishops' Conference of the Philippines (CBCP), that the pope won’t be present for the 400th year celebration of the University of Santo Tomas. CBCP News said no reason was given. The 83-year-old Supreme Pontiff will instead send a representative. "The Holy Father will not be coming to Manila for the anniversary, but given the importance of the quadricentennial celebrations of the university, His Holiness will be sending for the occasion his special envoy, whose name will be published in L'osservatore Romano the afternoon of Saturday, 27 November 2010," Adams was quoted by the CBCP News website as saying. 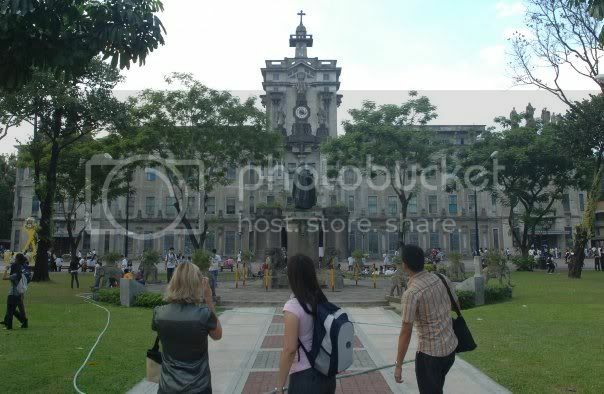 UST, founded April 28, 1611, is the only pontifical university in Asia. The CBCP story noted that UST had hosted three papal visits: Pope Paul VI on Nov. 28, 1970 and Pope John Paul II on Feb. 18, 1981 and Jan. 13, 1995. 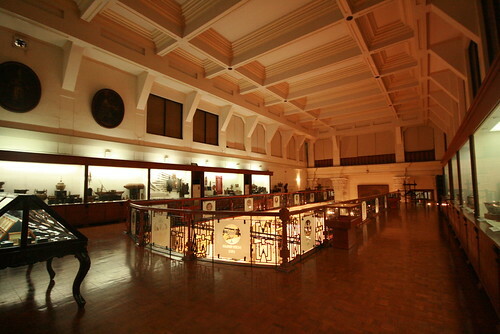 The Lumina Pandit exhibit will formally open at the UST Library this Thursday. 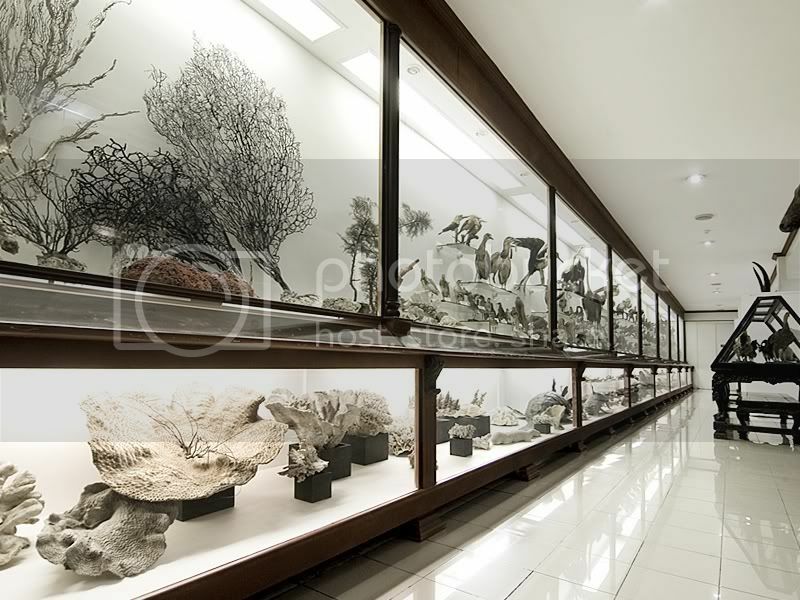 Ang ganda ng loob ng exhibit. ASIDE from Pope Benedict XVI, Spain’s king and queen have turned down an invitation to grace the 400th year celebration of the Pontifical and Royal university. Vice Rector Fr. Pablo Tiong, O.P., in an interview, confirmed that King Juan Carlos I and Queen Sofia of Spain will not attend UST’s Quadricentennial in January next year. “They (king and queen of Spain) will designate a special representative, but I do not know if it will be a member of the royal family,” he added. Tiong said the Spanish throne did not give a reason for the rejection of UST’s invitation. Last May 7, papal nuncio Archbishop Edward Joseph Adams wrote a letter to Filipino bishops saying the pope won’t make it to the 2011 festivities. He did not state the reason. CBCP News, the official news agency of the CBCP, reported that the Pope will instead send his representative to grace the event, the name of which will be published on L’Osservatore Romano, the Vatican’s newspaper, on November 27. “The Holy Father will not be coming to Manila for the anniversary, but given the importance of the quadricentennial celebrations of the university, His Holiness will be sending for the occasion his special envoy, whose name will be published in L’osservatore Romano the afternoon of Saturday, 27 November 2010,” A dams said in news published at the CBCP website (cbcpnews.com). Tiong said the Pope’s non-acceptance of the invitation was expected. 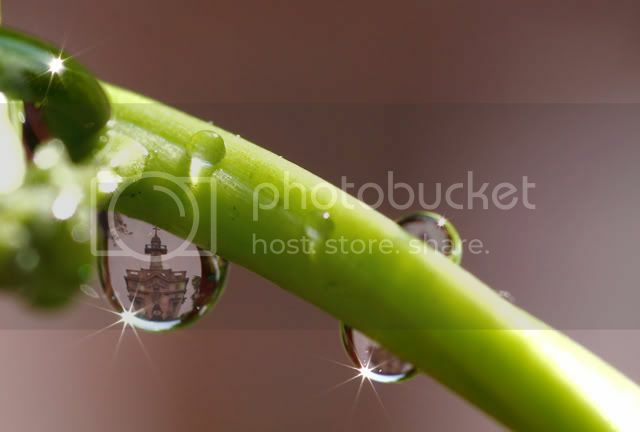 “Inasmuch as we would like that the Pope be around on [January 2011]… we had to be realistic. We are aware of so many factors that may prevent him from coming. 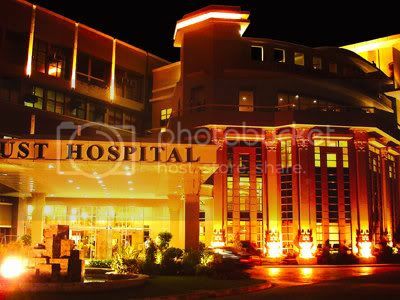 He has his hands full of so many problems and issues right now,” Tiong said. But Tiong admitted the Pope’s absence in the Quadricentennial will reduce the hype of the celebration. “[The Pope’s absence] will tone down a bit the level of celebration, but the Pope’s attendance is not absolutely essential, the event will go on,” he added. “We invited the Pope for the January 2011 celebration and that was the invitation which was refused. We have not invited the Pope for the closing ceremonies,” Tiong said. Meanwhile, Tiong said the royal couple of Spain were the only heads of state invited to the Quadricentennial, but foreign diplomats were also given invitations. “The designation ‘royal’ is by now a historical title and not a functional title anymore, in a sense that the title does not oblige doing anything special for the king and queen of Spain,” he said. 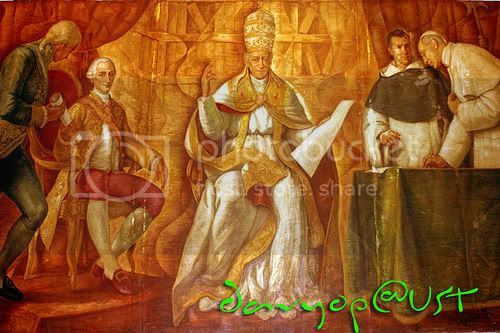 In 1785, King Charles III gave the title “Royal” to the University, while in 1902 through a papal decree, Pope Leo XIII bestowed the title “Pontifical” to UST, putting the University directly under the Holy See. 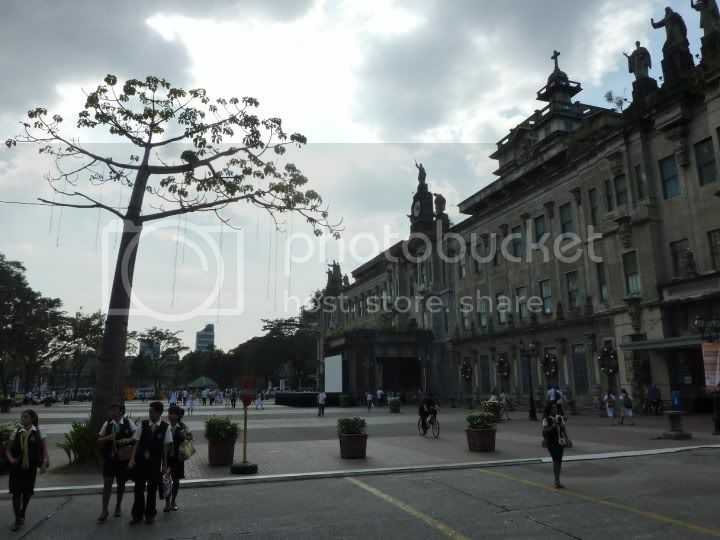 In the last decades, UST was paid visits by popes and a Spanish King: Pope Paul VI in 1970, King Carlos I in 1974 and 1995, and Pope John Paul II in 1981 and 1995. Is it true that foreign-based UST alumni who will be coming for the Quadri celebration can get 30% discount from Philippine Airlines? MANILA, Philippines - Burlington Basketball Tips, the award winning cage instructional program, will be shown at the Burlington booth at the Thomasian Global Trade Expo (TGTE) at SMX in Pasay City from Oct. 15-17. Hosted by champion coach Norman Black, the Burlington socks sponsored project received commendations from the Catholic Mass Media Awards (CMMA), Philippine Sportswriters Association (PSA) and the Sports Communicators Organization of the Philippines (SCOOP) for providing valuable lessons on air on the proper way to play the game. It was also cited for giving opportunities for the less fortunate to be part of the program. Visitors of the Burlington booth No. 234 will be treated to five volumes of BBT episodes with top PBA players in the late 80’s such as Samboy Lim, Allan Caidic, Benjie Paras and Abe King as guests of Black. Former UST players, led by Ed Cordero, are likewise expected to grace the Burlington booth. Burlington BioFresh socks, wristbands, headbands, towels, foot powder/spray will also be sold at marked down prices during the three day event which serves as part of the quadricentennial celebrations of the University of Santo Tomas. 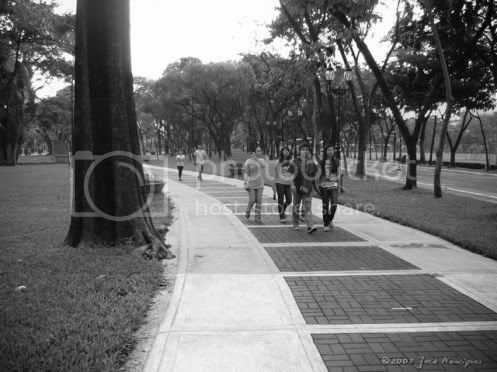 Photos courtesy of Sir Jay Agoo. 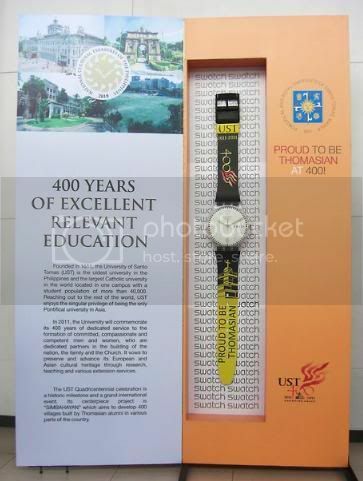 Tomasaiyan, the last photo of the Quadri watch was taken from my Facebook account: facebook.com/carlaandreamarie. Please give credit to the source of your photos, kahit na walang watermark. IN COMMEMORATION of the upcoming quadricentennial celebration of the University of Santo Tomas in 2011, the pontifical university has asked the Bangko Sentral ng Pilipinas to print a special series of bank notes with the UST logo. To recall, the BSP had paid tribute to the University of the Philippines in 2008 with the overprint of the iconic UP Oblation on a limited edition of 100-peso notes in honor of the centennial anniversary of the premier state university. Such UP “Oble” bills drew as much frenzy, especially among alumni and collectors, as the misspelled “Arrovo” bills that slipped in circulation in 2005. 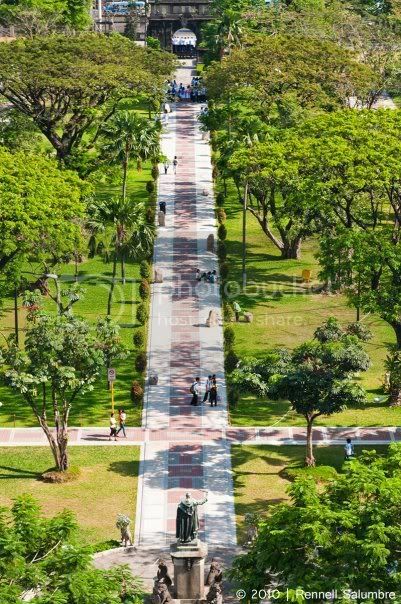 MANILA, Philippines - The University of Sto. Tomas recently announced that the school would set a new world record for the largest human rosary that would be formed by at least 20,000 participants. 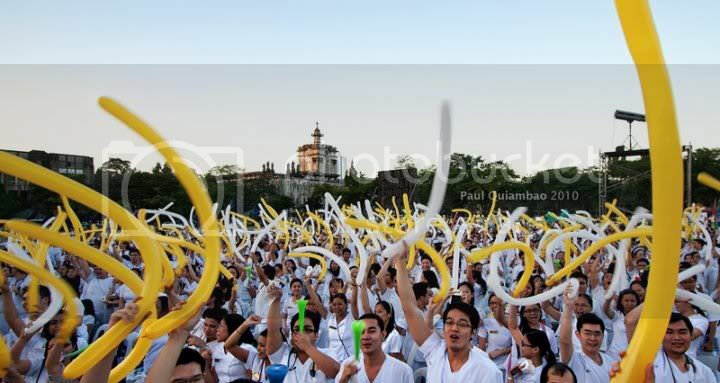 CBCPNews, the official news service provider of the Catholic Bishops’ Conference of the Philippines (CBCP) reported yesterday that in commemoration of UST’s 400 years of existence the school would assemble a huge group that would attempt to set a new world record for the largest human rosary. The school marks its 400th anniversary next year. UST, Asia’s oldest Catholic university plans to hold the human rosary during the Feast of the Immaculate Conception on Dec. 8. In the Facebook page devoted to the event dubbed as “Q Rosary,” the grand living rosary is a statement of UST’s unchanging love and devotion to the Blessed Virgin. 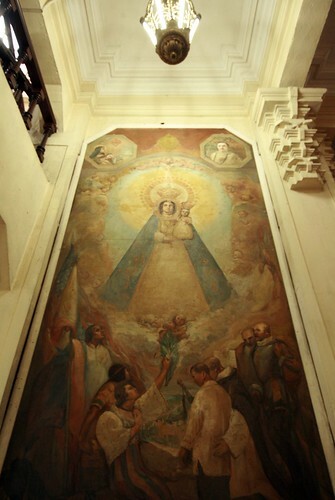 “Having been named ‘Colegio de Nuestra Señora del Santisimo Rosario’ at the time of its inception, UST has had a long history of devotion to Our Lady of the Rosary, patroness of the Dominican Order. It is in thanksgiving for 400 years of her maternal protection that the University shall hold the Quadricentennial Living Rosary,” the information on the Facebook page says. Participants to the grand living rosary would congregate along Arellano Drive, Ceferino Gonzales Drive, Osmeña Drive, A. Albert Drive, Quezon Drive, Leon Ma. 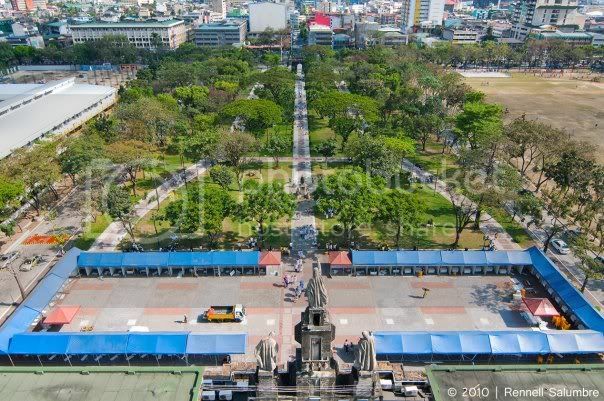 Guerrero Drive, and Araullo Drive, and within Plaza Mayor and Plaza Intramuros inside the UST campus along España Blvd. in Manila. Participants assigned to the Hail Mary beads would wear yellow shirts, while those assigned to the Our Father beads, the Cross, and the Center Medal would wear blue shirts. Those assigned to the connecting chains would wear white shirts. The grand rosary would be prayed from 4 to 5 p.m. and it would be followed by a Mass for the Solemnity of the Immaculate Conception. The Q Rosary was initially set on Oct. 7 but it was rescheduled because of the unpredictable weather. 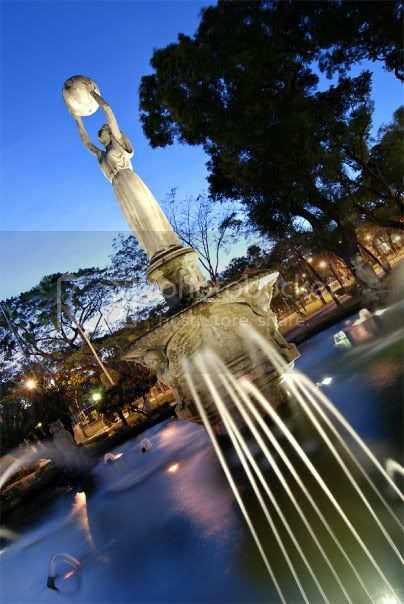 MANILA, - As a grand thanksgiving to the Our Lady of the Rosary for its 400 years of existence, the University of Santo Tomas (UST) will be organizing its students, alumni, faculty members, and administrative staff to form a big living rosary on the forthcoming Feast of the Immaculate Conception. Through the December 8 Marian event, Asia’ oldest Catholic University will also attempt to set a world record of the largest human rosary with some 20,000 participants. 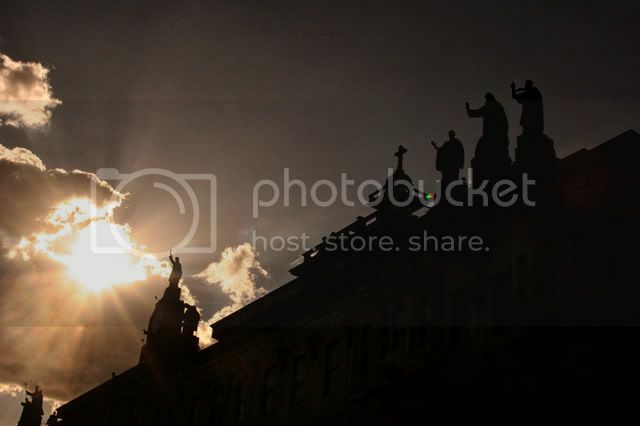 According to a Facebook page devoted to the event dubbed “Q Rosary,” the grand living rosary is a statement of UST’s unchanging love and devotion to the Blessed Virgin. Participants of the grand living rosary will congregate along Arellano Drive, Ceferino Gonzales Drive, Osmeña Drive, A.Albert Drive, Quezon Drive, Leon Ma. 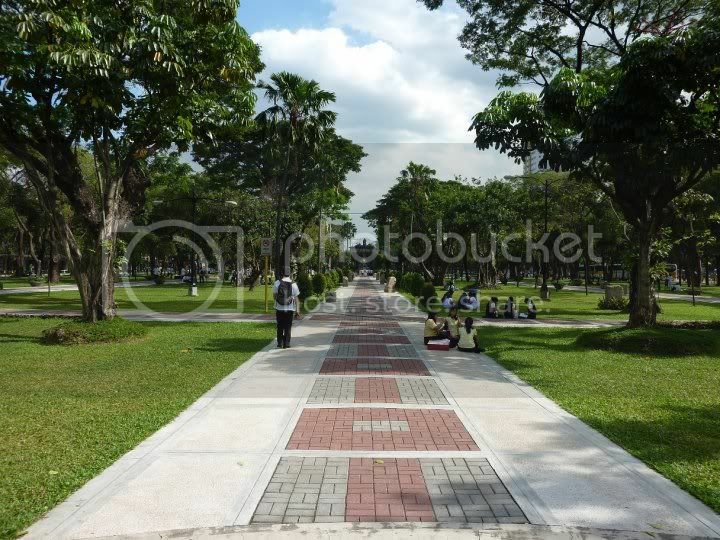 Guerrero Drive, and Araullo Drive, and within Plaza Mayor and Plaza Intramuros inside the UST Campus in Espana Manila. Participants assigned to the Hail Mary beads will wear yellow shirts, while those assigned to the Our Father beads, the Cross, and the Center Medal will wear blue shirts. Those assigned to the connecting chains will wear white shirts. The grand rosary will be prayed from 4 to 5 p.m. and a Mass for the Solemnity of the Immaculate Conception will follow. IN CONNECTION with the Quadricentennial of the University of Santo Tomas next year, the Varsitarian, the 82-year-old official student publication of the University, will hold “Valik-Varsi,” the grand alumni homecoming, on Dec. 11 at the Plaza Mayor in UST, España, Manila. The reunion of alumni of the country’s oldest Catholic campus paper is a “special edition,” the Varsitarian 2010-2011 staff led by editor in chief Cliff Venzon has announced. 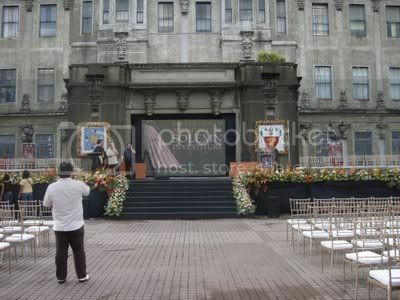 It is organized to pay tribute to UST, which will turn 400 years old next year as Asia’s oldest university. Expected to attend the reunion are some of the country’s top journalists and media professionals, such as Neal Cruz, Rina Jimenez-David, Penny Azarcon-de la Cruz, and Ernesto Sarmiento of the Inquirer; Jullie Yap Daza, Isabel de Leon and Nestor Cuartero of Manila Bulletin, Alico Colet-Villadolid of New York Times, Antonio Lopez of BizNews Asia magazine. Fr. Nick Lalog of Radio Veritas, and Bong Osorio of ABS-CBN. Expected to attend is UST Rector Magnificus Fr. Rolando V. de la Rosa, OP, who was a Varsitarian editor in the late 1970s. Also expected to attend is Fr. Norberto Castillo, O.P., former UST rector (1982-1990), and Fr. Albert Alejo, SJ of the Ateneo de Davao. Also attending are National Artists F. Sionil Jose and Bienvenido Lumbera, as well as other titans of Philippine literature—Cirilo Bautista, Cristina Pantoja-Hidalgo, Normal Miraflor and Eric Gamalinda. Artists Danny Dalena and Remy Boquiren, former Varsitarian art editors like the late National Artist J. Elizalde Navarro, are also expected to attend. There will be a tribute to Varsitarian alumni who have passed away—Ophelia Alcantara-Dimalanta, Wilfrido Nolledo, Jose Burgos Jr., and Eric Giron. 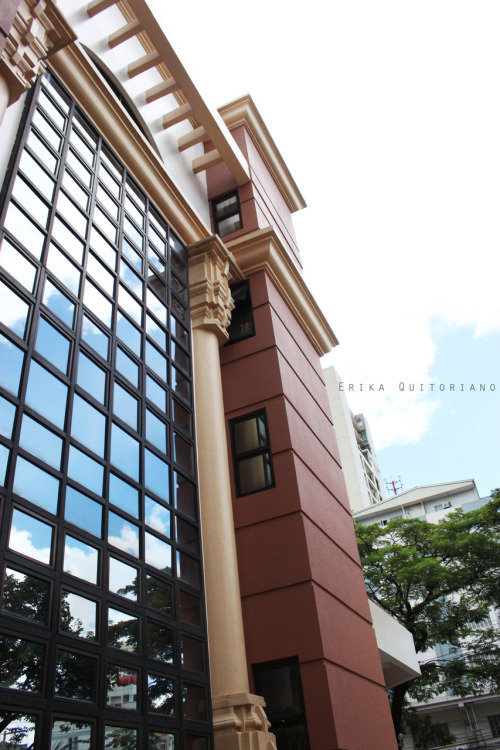 The Varsitarian was founded in 1928 by Jose Villa Panganiban, the first director of the National Language Institute. 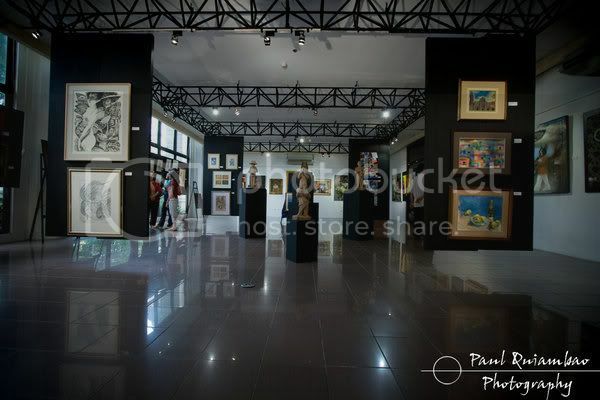 It is the only school paper to merit an entry in the Cultural Center of the Philippine Encyclopedia of the Arts for having produced many noted writers and artists. Visit the Varsitarian office at Room 105, Tan Yan Kee Student Center, UST, España, Manila. Call at 4061611 loc. 8235, 0915-8663289, or 0906-5565054. Follow on Facebook at Valik Varsi 2010.